Our range of designer floorstanding and counter-top water coolers can provide chilled, ambient and even boiling hot water at your fingertips with bottled or mains fed filtered supplies. Puriflow Filters are able to offer a select range of high quality water cooler systems from Borg & Overstrom, suitable for the office, both the working area, meeting rooms and the office kitchen areas, homes, gyms or any area where chilled, ambient and even sparkling filtered water is required. The systems offered here can provide chilled, ambient, chilled sparkling and hot water solutions with a range of styles and solutions to suit all budgets. Importantly, many of our coolers can be either mains fed or bottle fed and some of them even have the advantageous option of enabling you to easily switch from mains to bottled fed, making your cooler even more versatile. Where feasible, we highly recommend using a mains-fed and plumbed in water cooler for which we can provide the filters to ensure that the water you dispense is as good or even better than the bottled versions which are typically expensive, often of uncertain quality and unfriendly to the environment. Save money and helps the environment! Water is drawn from the mains into the cooler, filtered and chilled before dispensing, providing a constant supply of great tasting water for all your colleagues and clients. 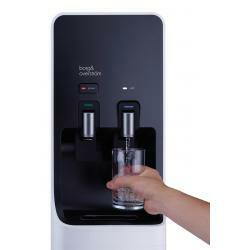 You can even supply hot and sparkling water too, giving your working environment that extra quality edge. With a plumbed in water cooler you can benefit from having a more environmentally sustainable office, without the need to spend money of heavy, expensive bottles and regular bottle deliveries and having to waste space storing a stock of the large bottles. Where you have no access to the water pipes, bottled water coolers are a very viable alternative. The great thing about our coolers, is that they can give you both mains fed and bottle fed in a single unit. Borg & Overström B2 Water Countertop Water Cooler (Black) ..
Borg & Overström B2 Water Countertop Water Cooler (Silver) Unique and..
Borg & Overström B2 Water Countertop Water Cooler (White) Unique an..
Borg & Overström B2 Water Cooler - floor-standing Unique and ele..
Borg & Overstrom B5 Water Cooler A design like no other The B5 range straddles ..
Borg & Overström Leak Detector for B2 and B3 Water Coolers Greatly reduce the risk of..
Borg & Overström Wall Bracket Set for B2 and B3 Water Coolers Reduce health and..
Borg & Overström Waste Kit with Level Sensor for B2 and B3 Water Coolers Is your cooler u..
Borg and Overstrom B3 Countertop Water Cooler - Silver The Borg and Overström B3 di..
Borg and Overstrom B3 Countertop Water Cooler (Cold and Hot) The Borg and Overstrom B3 direct chi..
Borg and Overström B3 Floor-Standing Water Cooler -Silver The Borg and Overström B3.. Bottle Conversion Kit for Borg & Overström B2 Water Coolers There are occasions..
Vorigo Installation Kit for Borg & Overstrom Water Coolers (or any other Water Cool..